I've been living in New England for a little over 6 years now and after this past Winter I would like to think of myself as a true Bostonian, that means I talk about weather all the time, get moderately excited about working from home during snow days & most of all - I am prepared regardless of how cold it is with my outfit choices! I wanted to highlight three outwear pieces that I've built up in my closet and if you're planning a visit to any cold weather place or happen to live in a cold weather state- these will keep you warm and looking pretty chic! I can't even tell you how difficult it was for me to find a faux fur vest that I liked last year. It was hard to find one that was nice, didn't look cheap and more than anything wasn't too bulky! I actually ended up finding two - one from Chicwish (under $45!) and one that my mom got me from Betsey Johnson. Here's how I'm looking to style them this year! These are my newest obsession! Slightly different from the faux fur vest - I think these look great when you're trying to put together a more casual look! These are some I've got my eye on! Suede in this cargo color is my favorite! A nice leather and shearling mix! The longer draping in the front of this Graham and Spencer one is beautiful! Of course if you're not sure about the trend Forever 21 has you covered with an under $35 option! My opinion of winter jackets has changed drastically since moving here. My biggest concern is how warm I am, only after that do I think of style. Thankfully with brands like Andrew Marc you don't really have to sacrifice comfort or warmth for style! 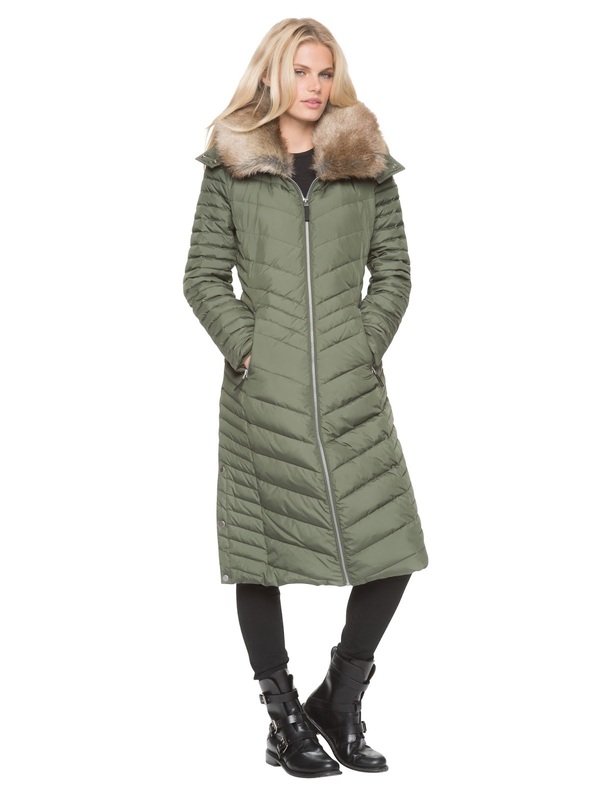 My current winter coat is this pack-able puffer from Tahari and I bought it last year in an olive/beige color! I'm slightly obsessed with it, but it's not quite long enough for those seriously cold and miserable days- enter in the need for another coat! 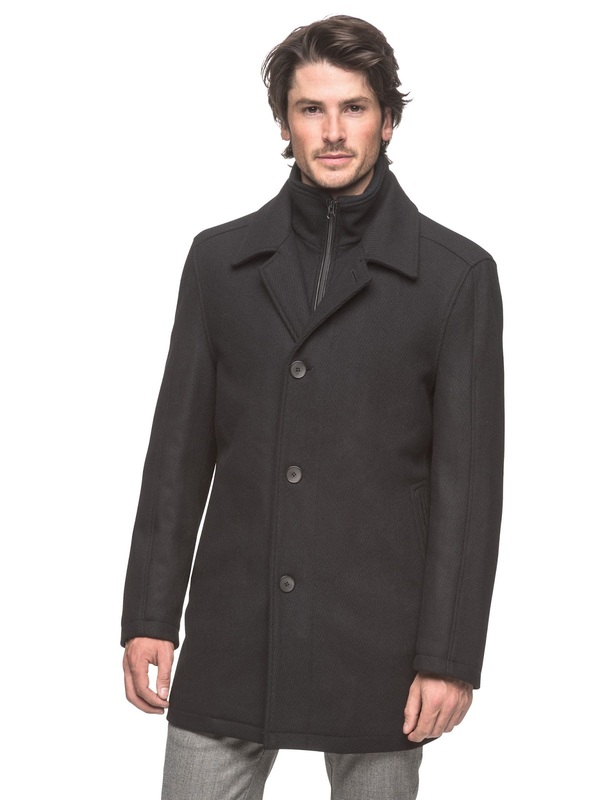 Andrew Marc has a section on their website for coats $250 and under - which if you've shopped for a great coat, you know is a great deal for a luxury brand! I've got my eye on this "Karen" coat that hits right below the knee and has a larger neck that can be popped up so it keeps you warm. I also really like the "Carissa" for when I need to be a bit more dressy and don't really want to wear a down comforter outside! A little faux fur always takes the look up a notch! Also, if you're in the market for some leather - Andrew Marc is having a Halloween sale starting tomorrow - up to 70% off black leather!! What's your go to winter outwear style? Thank you to Andrew Marc for sponsoring this post. All opinions expressed are my own! Love your faux fur vest and LOVE rocking mine. It's such a fun piece and soooooo warm. A shearling vest is on my list and I have about three pink coats so I don't really need another one. I do like the hood and the dudes coat is pretty fabulous. Yes, yes and Yes!! These are definitely all Winter staples. I am still on the hunt for a faux fur vest!! Your is fabulous!! I swear wearing a faux fur vest is the same as wearing a full coat sometimes, they are so warm!! It doesn't get cold enough in So. Indiana for those long winter coats but you look so chic in yours! I totally want a shearling vest too. My friend had one on our recent trip and I was smitten with it! Your faux fur vest is super cute. I've seen some that look REALLY rough and do NOT look cute (and of course you see someone wearing that ALL THE TIME), but yours looks cute and not cheap! Faux fur vests are my favorite! So chic and cozy! Loving all the faux fur vests :) They make my heart sing !!! I have yet to find a fur vest I like - I feel like they all look awkward on me! I could definitely use a longer winter coat, mine currently hits a little above the knees. Brrrr I am SO not ready for winter! These are great options Biana! I love my shearling vest. It's like wearing an Ugg boot! HAHA! If you can try to find one with lined pockets. I can't keep my hands out of mine. Love that fur vest BTW. I love that Carissa coat, doesn't give up style in the winter for warmth which is a plus! After seeing you in that faux fur vest I feel like I need one in my life! I'm loving all your outerwear staples! I'm so obsessed with vests (again!) this year too! Love the Karen coat, it looks super warm! Love all of these! I have several fur vests but want a new one for this year. And the Carissa coat is gorgeous! love that. Love those vests!!! Living in the south and in California I've never even thought about a long coat...I'm not sure I even knew about them! I'm so glad that I don't live up north where there's a true winter because I think that I'm too much of a weenie to be able to handle it! With that being said, we are headed to NYC in December so I'll definitely be looking for a good winter coat and maybe a faux fur vest! 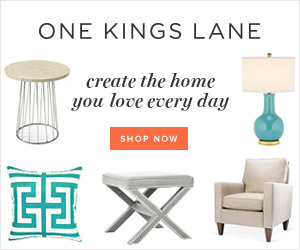 There's just so many cute ways to style it! I love your faux fur vest! I was the same way--so picky about which one I wanted! 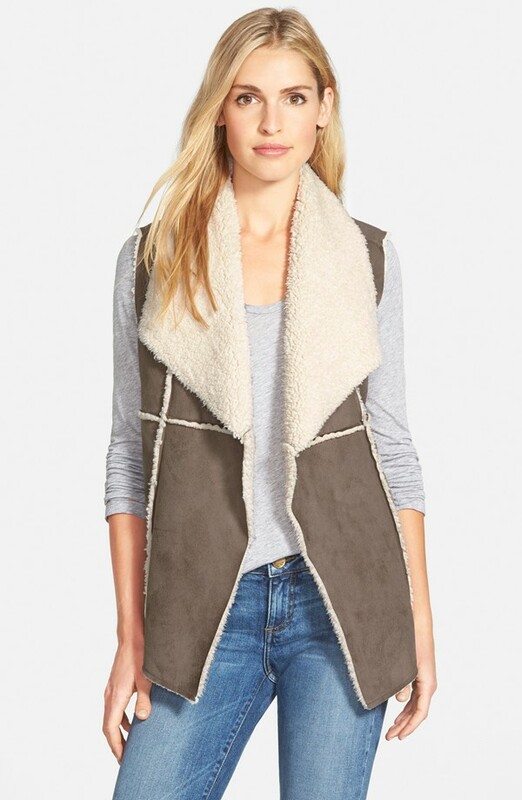 I am OBSESSED with the cargo shearling vest from Nordstrom! Perfection! I've been on the hunt for a fur vest and no luck, can't seem to find one that I like... I have a down coat as well, my only issue by the time I get to work I'm so warm and the building is blasting the heat, no happy medium! I am such a vest girl! Love these picks! I love the Carissa coat. I still haven't busted out my fur vest this year, but it really hasn't gotten that cold yet. One of these day's I'll get a down coat.. love your picks!! Love both of those vests in your first image! I'm not brave enough to try them yet, but I think they're super cute! I've got my eye on a mid-length puffer coat too. My pea coat just doesn't cut it when it's really cold! 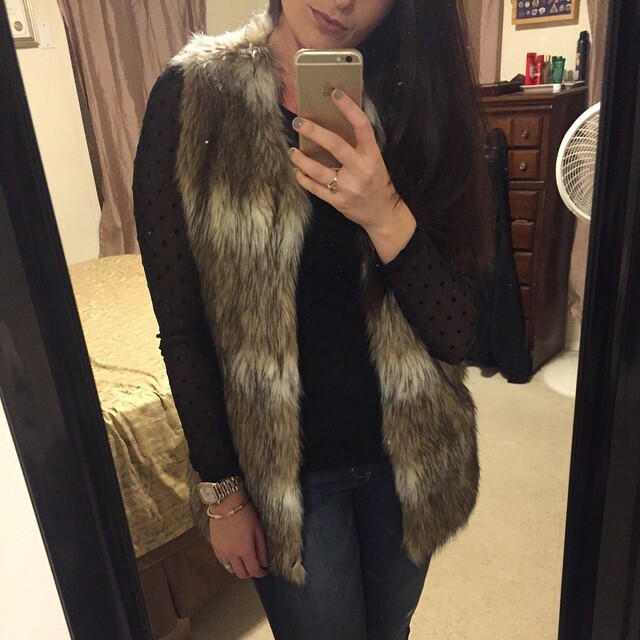 I have been searching for the perfect faux fur vest and I love that one from Chicwish! I may have to buy it! And I also love the sherling vests! I invested in a big/long Northface puffer coat last winter and I'm so glad I did! It is so warm! I sure wish it would cool down so I could wear all of these cute vests and coats! I got a little taste in Savannah which is nice! I really need to add a sherling vest to my closet! They are so cute!! Ok, I officially want/need a faux fur vest. Completely agree that they're really hard to find. I remember looking for one years ago and coming up empty. I really like the black shearling vest, it's so cute. After living in NH and Boston for six years, I can completely commiserate about the frigid conditions come winter time! Warmth definitely trumps style. Love that puffer coat that hits below the knee. I always make the mistake of not purchasing a longer coat and then come January, I'm regretting it! Great post! I'm all about a faux fur vest. LOVE yours! Love, love, love me a good faux fur vest. I actually thought to myself the other day, I need a good vest that isn't bulky. Love yours and how you styled it. I really like the black one listed too. Love my faux fur vests, I need a shearling one too! Loving the faux fur trend! 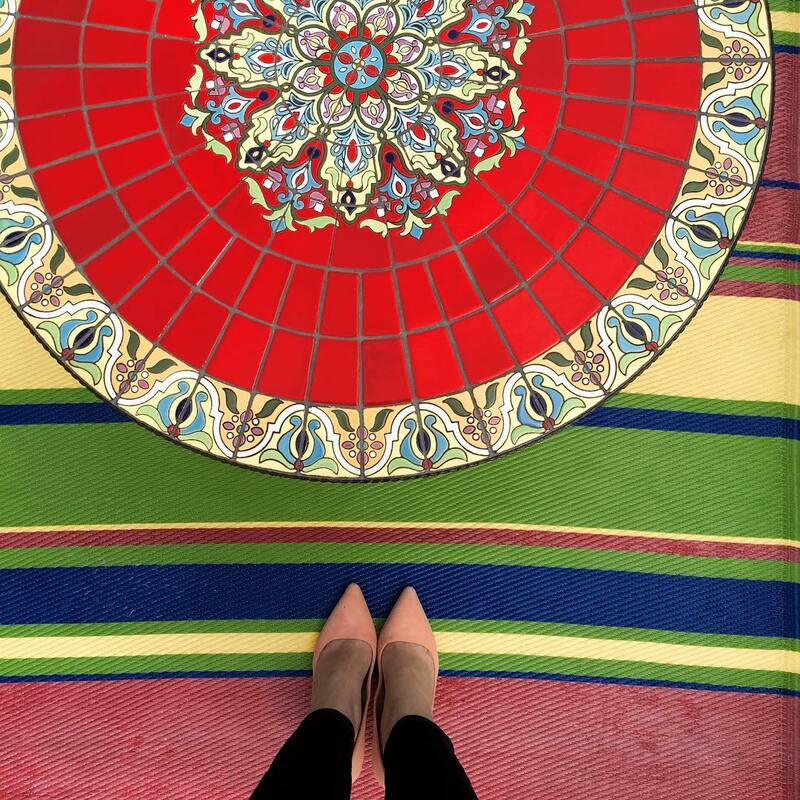 Such great styling inspiration! Ooh that fur vest. Love the pins. I am taking note of the styling tips. I love your picks! I don't think I need a winter coat that's too heavy down here, but I'm all about those vests! 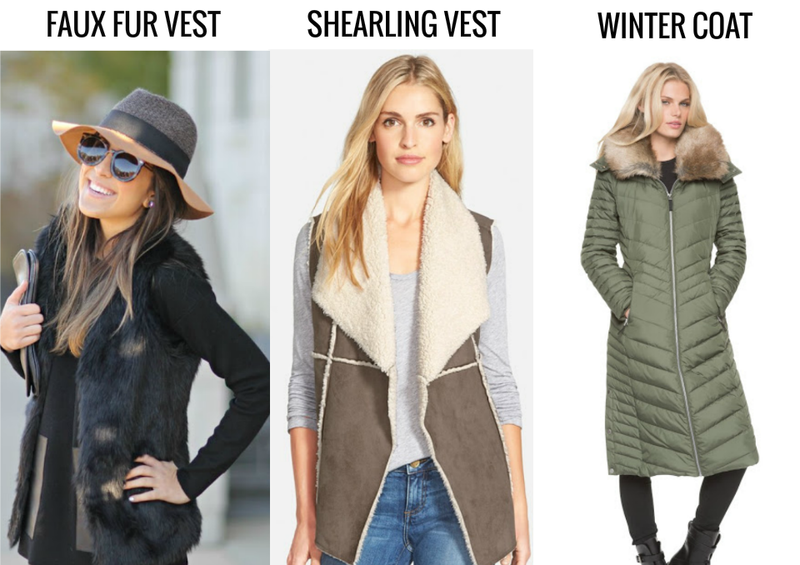 I love these options especially the shearling vests! I have been on the hunt to find the perfect one. The first option is right up my alley! Target has shearling vests right now that are only $25 - I picked one up and it's amazing! And sadly, I totally agree that a winter coat must be warm > cute... not looking forward to that coming soon! I've always loved faux fur vests but haven't stumbled on one that I love as yet. I love the color of yours which goes great over a black top and it looks so comfortable! 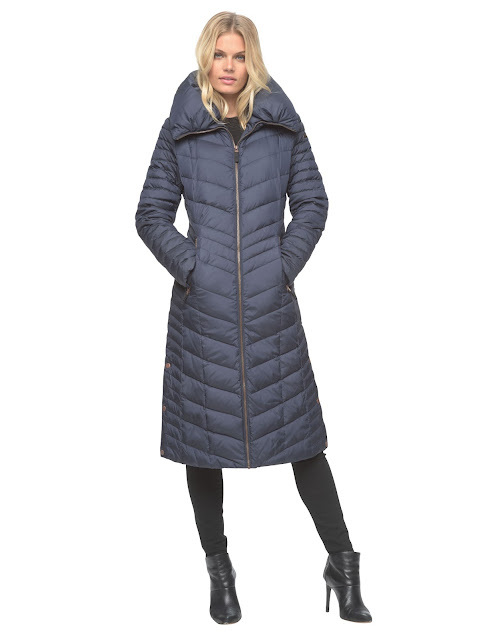 I LOVE my Andrew Marc long puffer coat that I purchased last year - I found it at Costco of all places! TJMaxx recently has had a ton of his stuff in stores, too. 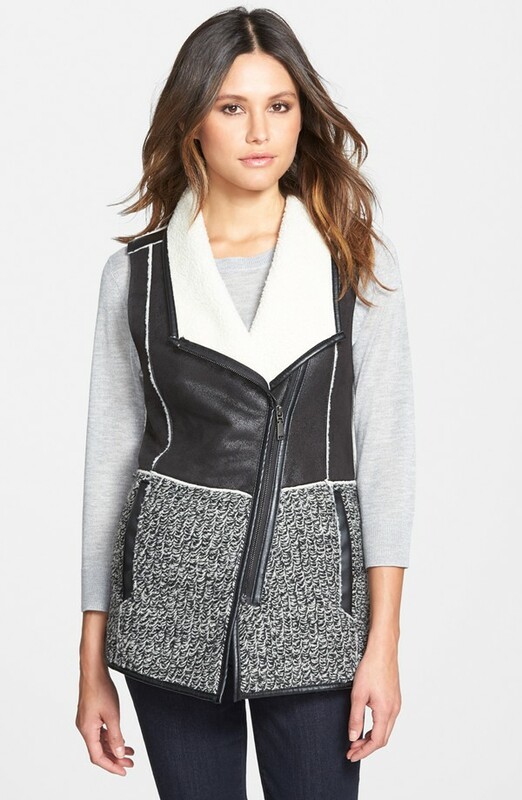 Also loving that black and leather shearling vest. Great roundup today! 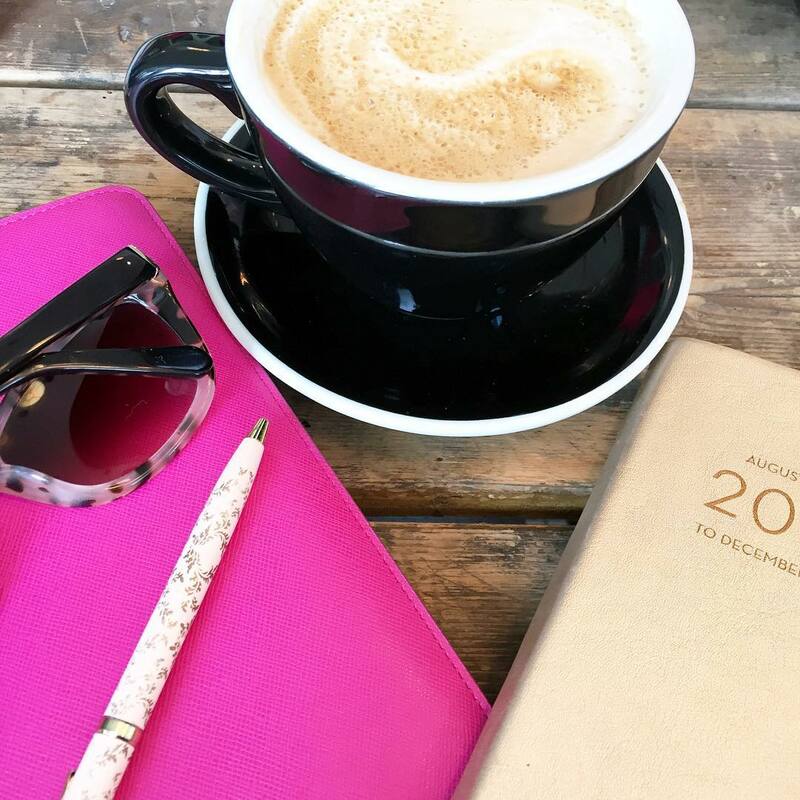 I am so glad that I have almost no need for any of these things! The bonus of moving 2 hours further south this past spring is much milder winter weather. I like your picks though! Love every single way you are showing a fur vest styled. I'm really thinking I need to add a new vest to my closet this year. I think mine is about 4 seasons old and I love the look of it but have always hated the bulk. I definitely love the shearling vest and agree the first one is my fave. Every one I've tried so far has been angled from back to front and managed to make me look heavier than I really am...may have to try this one! Thanks for all the suggestions. YES, long coats are essential here in Erie too. 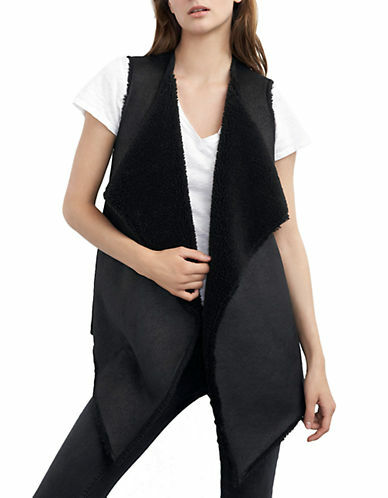 I couldn't find a fur vest in my price range that I loved, but am determine to find one this year. Love the way you styled them! I've got the vests down (but I'm always looking to add a few more!) but I am still having the hardest time finding the right winter coat. I get cold so darn easily, but I hate the big bulky ones since it makes me look/feel like the marshmallow man from Ghostbusters! That last picture of the fur vest is actually on my list for Friday Favorites this week!!! Is that he same vest from Chicwish? I am trying to decide if I can pull it off. It is going to have to be a little longer than normal vest length to not look puffy and ridiculous on me lol. I'm all about Winter coats that cover my backside ;-) I like the ones you picked especially the Carissa one that is definitely my fav! if i lived somewhere colder, i would totally buy the long olive green coat with the fur- love. I am all about that puffer coat! The bigger, the puffier, the warmer it is, right? And, I LOVE Olive Green! Umm, I'll take all those lovely winter coats, please!! LOVE the faux fur vests!! I got one for Olivia and I SO wish that they had it in my size! It's darling! These Jackets looks really cute and warm, Love the outfit with the over the knee boots and black dress, amazing!. I literally do not care what I look like as long as I'm warm. My long blue coat is not flattering but it's WARM! Otherwise I love my quilted vests from Old Navy and wool coats from Old Navy and LOFT. Winter in D.C. is also very cold and I often wear a similar coat to your Tahari. I really like your faux fur vest! I'm looking for one! 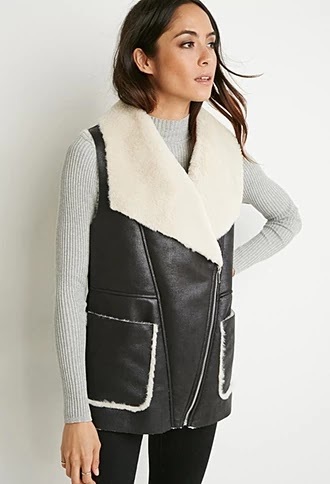 Totally obsessed with Shearling vests right now-such a fun casual look! Also, I think that Andrew Marc Carissa coat is calling my name! ohhhh i love that karen coat! so fun. i love the look of vests, but if i am cold enough for a vest, i'm also cold enough for a coat and the coat doesn't go over the vest and it's just a big ol mess. i really like the shearling ones though, so pretty! Since we never get real winter here, I always style it up with a peacoat, scarf and boots and I'm good to go. But if we do move to an actual cold state, I'll have to really re-think my options. I love your faux fur vest. do you wear scarves? I feel like I don't see you in them often. I have that same vest and it took me forever to find one too! I still want maybe one more to add to my collection though! I definitely want a faux fur vest...and I want a matching one for my little girl when she's born in February :) won't get much use out of one for her this winter, but there's always next year! I also think it's important to have a nice, wool pea coat--like a heavier one that will still keep you warm in the dead of winter. That way, if you are going out for a nice dinner or a party, you can feel a little more put together, instead of feeling like the kid from a Christmas Story. Long coats are a MUST in cold weather! Mine goes mid-thigh and it's definitely a staple for 4 months of the year for me! I love the shearling vest look! Just got my new winter coat yesterday... can't wait for it to be delivered!!!!!! It was originally almost $300 (Calvin Klein) but with sales and coupons I got it down to $130! SO PUMPED! Totally love all of these!! Living in KC I find a way to justify needing about 100 different coats haahha! you nailed it with the warmth over cuteness with the winter jackets. warmth ALWAYS wins!! Love the faux fur vest on you! I am afraid I would just look like Chewbacka in it! Or maybe just the legend of Bigfoot. But yes to the long coat. 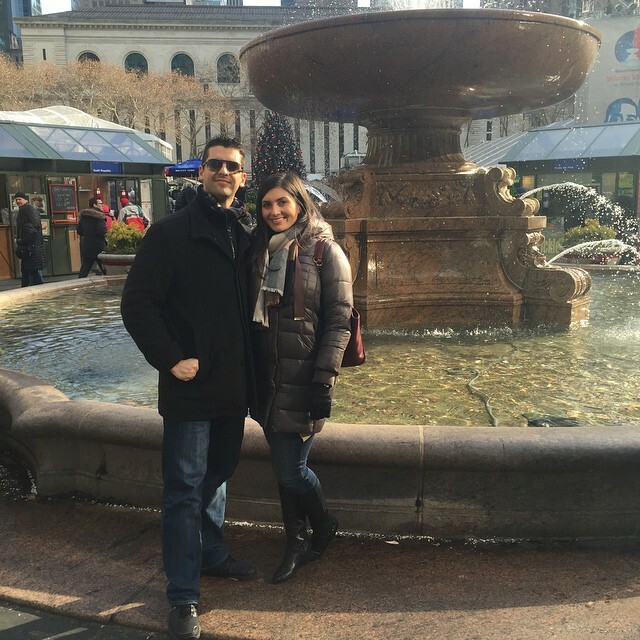 Boston winters are really similar to Chicago's and you HAVE to have a warm coat! I swear by my Northface Metro coat. It is like wearing a down blanket. i want one of those fu/shearling vests so badly i can't stand it! the outfits i'm dreaming up for it are so pretty that i just need to make it a reality. My #1 priority is always warmth. I have like 10 winter coats. It's a bit excessive, but I just love winter coats, haha! I bought a long puffer jacket last Winter, so needed for these massive snow storms. Keeps you so warm! As much as I love the faux fur vests on everyone I just don't know if I could pull one off... however, the shearling I am going to be on the hunt for-- so cute!